From checking emails and texts to capturing photos, feature-rich Apple® iOS devices have found their way into the workplace. But when iOS devices are deployed in a more challenging environment ? such as direct store delivery, field service, or hospitals – daily threats like drops on concrete, dirt and dust, and harsh disinfecting chemicals test their durability. Until now. 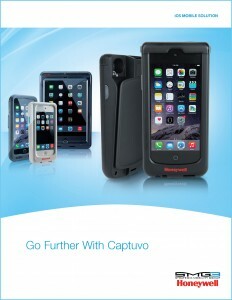 Honeywell?s Captuvo enterprise sleds can increase profitability through enhanced productivity and accuracy. Maximize your enterprise?s mobility with Honeywell to get a greater return on your hardware investment and lower the total cost of ownership.